I’ve been so busy making Christmas presents and cards that I kind of forgot about posting anything on the blog. I thought that I should show you some more of the cards I have made as the pictures are sitting ready to posted. 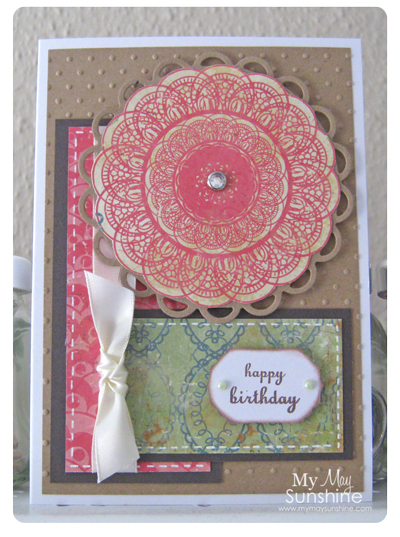 This is a birthday card that I made a while back and love the pretty papers in the Crate Papers Restoration pad. I simply cut out the doily from one of the papers and added a gem brad and stuck it to a lacey circle. The card quite simple but with the pattern of the doily, it brings the card together nicely. Paper – Crate Paper Restoration | Stamp – Paula Pascual | Ribbon – Hobbycraft | Brad – Making Memories | Embossing folder – Cuttlebug Swiss Dots | Pearls – Hobbycraft.